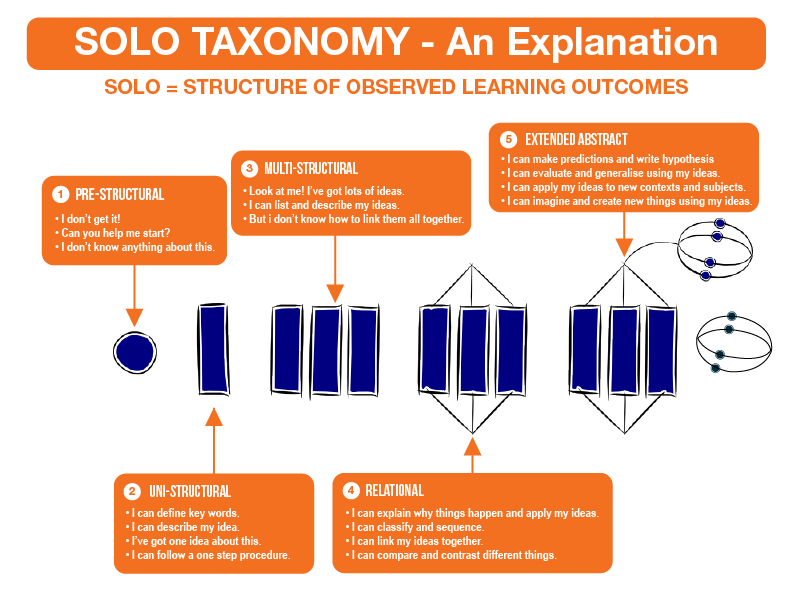 The Structure of the Observed Learning Outcome (SOLO) taxonomy is a model that describes levels of increasing complexity in student's understanding of subjects. Pre-structural – The task is not attacked appropriately; the student hasn’t really understood the point and uses too simple a way of going about it. Uni-structural – The student's response only focuses on one relevant aspect. Multi-structural – The student's response focuses on several relevant aspects but they are treated independently and additively. Assessment of this level is primarily quantitative. Relational – The different aspects have become integrated into a coherent whole. This level is what is normally meant by an adequate understanding of some topic. Extended abstract – The previous integrated whole may be conceptualised at a higher level of abstraction and generalised to a new topic or area.